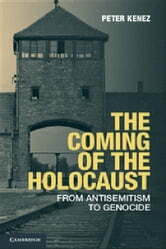 The Coming of the Holocaust aims to help readers understand the circumstances that made the Holocaust possible. Peter Kenez demonstrates that the occurrence of the Holocaust was not predetermined as a result of modern history but instead was the result of contingencies. He shows that three preconditions had to exist for the genocide to take place: modern anti-Semitism, meaning Jews had to become economically and culturally successful in the post-French Revolution world to arouse fear rather than contempt; an extremist group possessing a deeply held, irrational, and profoundly inhumane worldview had to take control of the machinery of a powerful modern state; and the context of a major war with mass killings. The book also discusses the correlations between social and historical differences in individual countries regarding the success of the Germans in their effort to exterminate Jews.